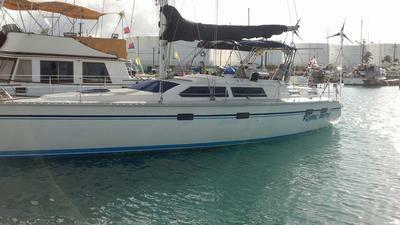 ' Flying Faith ', a Hunter Passage 42 Sailboat For Sale! $75,000 OBO! 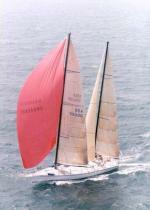 'Flying Faith', a Hunter Passage 42 Sailboat For Sale! $75,000 OBO! BEAUTIFULLY MAINTAINED RARE FIND! 42' Hunter Passage ready to set sail! She is a fully equipped high volume Hunter cruising yacht for a fraction of replacement value! Her saloon and galley area are huge and well positioned to be used at sea. A generous front cabin and head area are also features of this model. The center cockpit is fantastic for safety and maneuvers at sea. This Hunter 42' Passage has a great cruising layout with two private staterooms, two full heads, a wonderful galley, and a huge amount of well organized and accessible storage. The master stateroom is aft with a large centerline island queen bed. As you move forward to starboard, the passageway leads forward to the salon. Along the outboard side of the passageway there is first a large cedar lined hanging locker. Next, forward is the Nav Station. The seat for the Nav station is contoured teak for secure and comfortable seating in any kind of seaway. The electrical control panel and access to the engine compartment is located along the side of the passageway. The wrap around the galley is the port aft area of the salon. The engine compartment forms the base of the companionway. 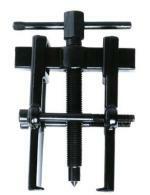 Easily accessible from all four sides this arrangement makes routine maintenance and inspection a breeze. The main salon features a spacious comfortable wrap around the settee along the forward starboard area of the salon, with a matching settee to port. The beautiful high gloss dining table for entertaining, teak and holly sole, and interior woodwork gives the salon an open yet traditional feeling. There are numerous opening hatches, several large opening ports all designed to provide ample light and ventilation. The main salon has a 6' 6" headroom. The forward stateroom is a large double Pullman berth to starboard. An opening "window" with a folding wood screen has been designed in the bulkhead between this stateroom and the main salon, so that when privacy is not desired, it can be opened, giving both the area an open feeling and additional ventilation. This cabin has a large cedar lined, hanging locker, large shelves, dresser drawers, and a built in book rack. The second head is forward of the guest stateroom. It also has Corian countertops, a vanity with sink, a shower with sump, its own holding tank, and macerator. Many extras: 2 main sails, 4 person life raft, tool boxes, and much more! MOVING, SO MUST SELL. MAKE AN OFFER!!!! Comments for 'Flying Faith', a Hunter Passage 42 Sailboat For Sale! $75,000 OBO! Re the comments by 'Anonymous', perhaps the owner could clarify the situation? What??? Can't post pics of actual boat??? Something seems a little fishy?? The pictured vessel is a Hunter Passage 42, the described vessel is a Hunter 420. While the two vessels are similar in layout and size, there are significant differences. The Passage 42 has the passage aft on the port side and the nav station faces out while the 420 has that passage on the starboard side with the nav station facing forward. The P42's aft head is on the starboard side and includes a sit tub while the 420's aft head is on the port side and does not include a tub. The galley in the P42 is on the starboard side while the galley in the 420 is on the port side. Similarly, the salon is also reversed between the two vessels. Going forward, the P42 has it's forward head accessible directly from the salon as well as from the forward cabin while the 420's forward head is in the bow and only accessible through the forward cabin. On the exterior, the swim platform on the P42 is accessed by two sets of steps, one on each side, the 420's has a single set of steps in the middle. I'd also note the P42 has a stainless steel arch while most of the 420s have a fiberglass/composite arch. In the salons, the P42 has much bigger ports. Really? The description is as submitted by the current owner. The boat named and pictured is a Hunter Passage 43, the boat described in the narrative is a Hunter 420, similar but different boats.